Chris Wilder: Sheffield United chief celebrates with the 5,500-plus Blades fans. SHEFFIELD UNITED manager Chris Wilder admits his side and Leeds United are more than likely chasing just one automatic promotion place due to the stunning form of leaders Norwich City. The Blades boosted their hopes of a top-two finish with a 1-0 victory at Preston North End. Leeds United’s defeat at Birmingham City – former Blade Che Adams getting the winner – meant Wilder’s United leapfrogged their West Yorkshire rivals in the race for the Premier League. Just a point separates the two Uniteds, while Norwich are seven points ahead of the Blades after making it 10 wins from their last 11 outings via a 4-0 thrashing of Queens Park Rangers. “Daniel (Farke, Canaries manager) has done a remarkable job to win eight (straight) games at this stage of the season,” Wilder told The Yorkshire Post. “I would be very surprised if they do not win the division. They have been consistent and steamed ahead. We are just desperate to try and hold on to them. The connection with the fans is priceless,” he said. “They understand what the lads are putting in. They have had enough to put up with. Leeds can reclaim second place tomorrow night when, in a strange quirk of the fixture list, head coach Marcelo Bielsa’s men travel to Deepdale. Twenty-four hours later the Blades face Birmingham at St Andrews. It continues a schedule introduced this season that sees midweek Championship fixtures split across two nights to allow live broadcast by Sky. Asked if playing the night after Leeds are in action was an advantage or hindrance in the promotion scrap, Wilder replied: “The one thing I have moaned about is when we play teams on the Saturday who played on the Tuesday. “I do not understand that. We had it when we played Hull at the start of the season. I know people say you have an extra day somewhere else, but it isn’t, really. Because you want recovery. 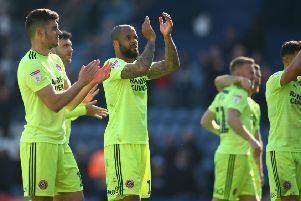 David McGoldrick’s 13th goal of the season was enough to secure three precious points against a Preston side harbouring hopes of gatecrashing the play-offs. It came just a minute or so after Leeds had fallen behind at Birmingham, mirroring the events of the previous week when Bielsa’s men had gone in front at home to Millwall at almost exactly the same time as the Blades had conceded for the final time in a 3-2 home defeat to Bristol City. Asked about the potential significance of stealing a march on Leeds via McGoldrick’s first-half winner, Wilder added: “No one knows until the end of the season and you can sit back and reflect. “That is the time when you can recognise how you ended up where you did. But we are in a fantastic position, of course. “We don’t want to go away. We have earned this, we are enjoying it and we want a little bit more. It has been a great season, but there are six games to go. Wilder was also full of praise for the travelling army of 5,577 fans who helped Preston post their third-highest attendance of the season.